The Dewoitine D.520 was the best fighter in the inventory of the Armee de l'Air at the time of the German invasion in May of 1940. Unfortunately, it was only just coming into service, and there were only a small number available. The D.520 was designed in November 1936 by a team led by Emile Dewoitine - at that time director of a private design office - and was designed in response to a specification issued in 1937 for a single seat fighter. It was to have a maximum speed of 323 mph (520 km/hr), and the designation D.520 was assigned, with 520 the maximum speed in kilometers per hour. It was expected that the airplane would eventually be powered by the 1,200 hp engine under development by Hispano-Suiza. The Dewoitine design office became part of the Societe Nationale de Construction Aeronatiques du Midi (SNCAM), when the French aviation industry was nationalized in 1937. The delays created by this event would be responsible for the D.520 not being available in needed numbers when war came. The first prototype flew on October 2, 1938 at Toulouse-Francazal with Chief Test Pilot Marcel Doret at the controls. The second prototype flew time on January 28, 1939, with a completely redesigned vertical tail, sliding cockpit canopy, and armament of one 20mm cannon firing through the propeller hub and two machine guns in gondolas under the wing. When powered by a 12Y-31 engine in place of the original 12Y-29, maximum speed increased to 341 mph at 17,060 feet, and it could climb to 26,240 feet in 12 minutes, 53 seconds. Flight trials went well, and an initial contract for 200 production D.520s powered by the 830 h.p. 12Y-31 engine - replaced later by the 910 h.p. 12Y-45 - was issued in March, 1939. A contract for an additional 600 D.520s was issued that June. Following the outbreak of war in September, a new contract brought the total to 1,280, with a production rate to be 200 machines per month as of May, 1940. The order was amended on April 19, 1940 for 2,250 D.520s with a production rate of 350 per month. 120 D.520s had been ordered by the Aeronavale in January, 1940. Groupe de Chasse I/3 was the first o equip with the D.520, in January, 1940. The D.520 was popular, with pilots praising it for sensitivity of control, simplicity of the instrument panel, and ease of spin recovery. A D.520 was flown against a captured Bf-109E-3 on April 21, at Orleans-Bricy, the test revealed the Bf-109E-3 had a 20 mph speed advantage due to its more powerful engine, while the D.520 had superior maneuverability. When the Germans invaded on May 10, 1940, only GC I/3 had D.520s, while only 79 D.520s had been delivered. GC I/3 met the Luftwaffe for the first time on May 13, with the D.520s shooting down 3 Hs-126s and one He-111 without loss. During the following month, GC II/2, GC III/3, GC III/6 and GC II/7 received D.520s, and all saw service in the battle of France. GC II/6 and GC III/7 converted too late to see any action. By the Armistice of June 25, 1940, 437 D.520s had been produced, with 351 delivered to operational units. The D.520s scored 108 confirmed kills and 39 probables, for a loss of 85, with 54 due to direct enemy action. Following the Armistice, the Vichy government was allowed to keep a reduced air force. No D.520 unit was to remain in service in Metropolitan France, so all surviving D.520 were sent to North Africa; GC I/3, II/3, III/6, and III/7 - as well as Aeronavale Escadrille 1AC - were allowed to remain in service. In April 1941, the Germans allowed aircraft production to resume in Vichy France. SNCAM was dissolved and the plants were absorbed by S.N.C.A. du Sud-Est (SNCASE). The Vichy Air Force adopted the D.520 as its standard fighter, and production of the D.520 to resume at Toulouse-Blagnac was allowed, with 550 D.520s ordered June 23, 1941, to replace all other single-seat fighters in service. GC III/6 and II/3 saw combat against the Royal Air Force in Syria during June-July 1941, during which GC III/6 gained 19 confirmed victories and four probables, while GC II/2 had three confirmed victories and two probables, and Aeronavale Escadrille 1AC got eight victories. Vichy losses totaled 32 - 11 shot down, 12 lost in accidents, 7 destroyed in the ground, and two abandoned when the units flew back to French North Africa. When the American invasion of North Africa came in November, 1942, 234 D.520s were in unoccupied France, with 93 serviceable, 173 were in North Africa, and 30 were in Senegal. French-based GC I/2 escaped to Meknes on November 9 with 24 aircraft to avoid capture by German forces. Air battles that included the D.520s of GC III/3 and II/5, Aeronavale 1AC, and the Hawk 75s of GC I/5 and II/5 resulted in the Aeronavale losing 19 D.520s, while the Air Force units lost 16 D.520s and Hawk 75s. Responding to the Allied landings, the Germans invaded Unoccupied France, and on November 27th, all French armed forces were disbanded. 246 D.520s serving with Vichy units and 169 D.520s in various stages of completion at SNCASE were seized. Some were given to two Luftwaffe fighter training units, JG-103 and JG-105, where they were highly praised for their exceptional maneuverability, though the accident rate was fairly high, due to the differences between the D.520 and German aircraft. 60 D.520s were sent to the Regia Aeronautica where they were operated as fighter trainers. 100 D.520s were given to the Bulgarian Air Force, which used them operationally against the U.S. 9th Air Force, where most were lost in combat. The Romanian Air Force operated an squadron of D.520s on the Eastern Front in 1943. Following the invasion of Southern France in August 1944, Dewoitine test pilot Marcel Doret formed the Groupe Marcel Doret of the Forces Francaises de l’Interieur (FFI) with 55 D.520s liberated from the Luftwaffe, later reinforced by 20 brought back from North Africa. Doret led the Groupe in attacks on retreating German units and escorted Allied bombers, until the unit was re-equipped with the Spitfire Vb in March, 1945, and the D.520s were transferred to GC B I/18 and a training unit. After the war, the D.520 served with training units in the revived Armee de l’Air, while several were converted to two-seat configuration under the designation D.520 DC (for "double commande"). The last unit to fly the D.520 was the Escadrille de Presentation de l’Armee de l'Air, which had flown Yak 3s brought to France by the Normandie-Niemen regiment. The last D.520 was withdrawn from service in September, 1953. 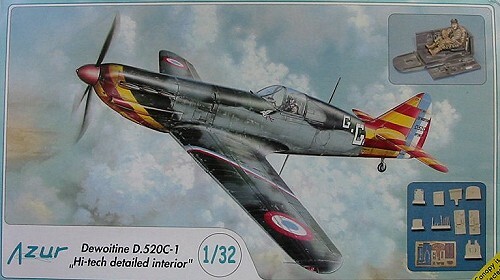 Azur released the D.520 as its first 1/32 kit back in 2003. That release had a minimum of resin parts. 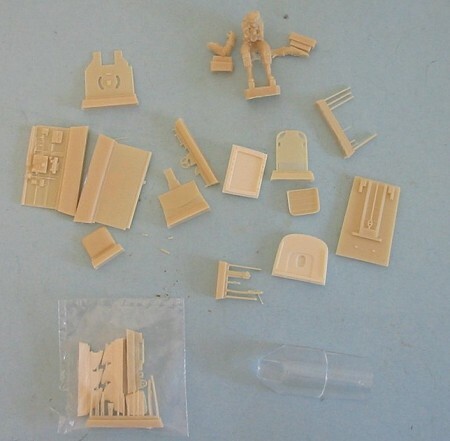 Follow this link for a look at the base kit. This new release has a far more detailed cockpit, all in resin, that includes a very realistic pilot figure for those who like to populate their cockpits. Photo-etch seatbelts are also provided. 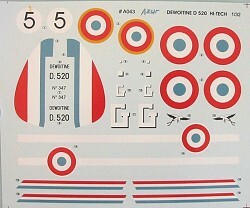 Decals are included for the D.520 flown by Gabriel Gauthier of GC II/7 with the Vichy Air Force in North Africa in 1941 and 1942, and the D.520 flown by Marcel Doret himself in the fall of 1944. I think this release, which was done in cooperation with French modelers who are very knowledgeable about the D.520, is a great improvement over the original release. The canopy is molded in one piece, but it took me 5 minutes with an X-acto to separate the rear piece and then saw the canopy and windscreen apart, and the sliding portion will go over the rear section without problem. This will allow full display of the improved cockpit. To me, the D.520 is the best-looking French fighter of the war, and airplane that might have been as famous as the Spitfire had the Battle of France gone differently in 1940. I’ve done the D.520 in 1/48 from a Gull Models vacuform, an LTD limited-run kit, and twice from the Tamiya kit. I definitely look forward to this project. Thanks to Hannant’s - www.hannants.co.uk - for the review kit.